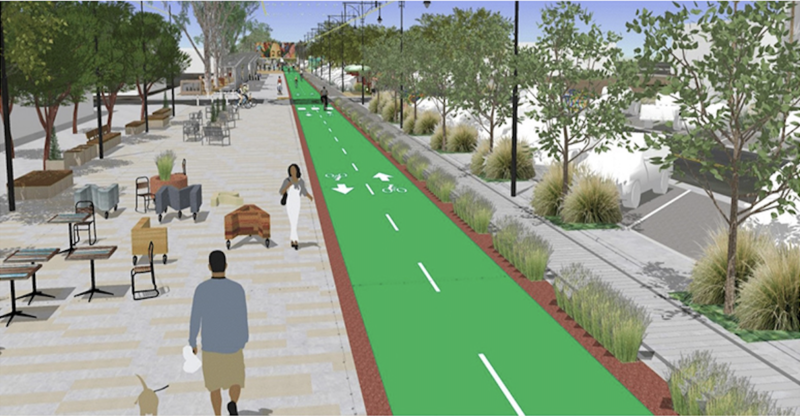 On Thursday night, staff from San Diego's Traffic & Storm Water Division (TSW) presented slides detailing the West Point Loma Blvd bike lane project to the Peninsula Community Planning Board (PCPB). 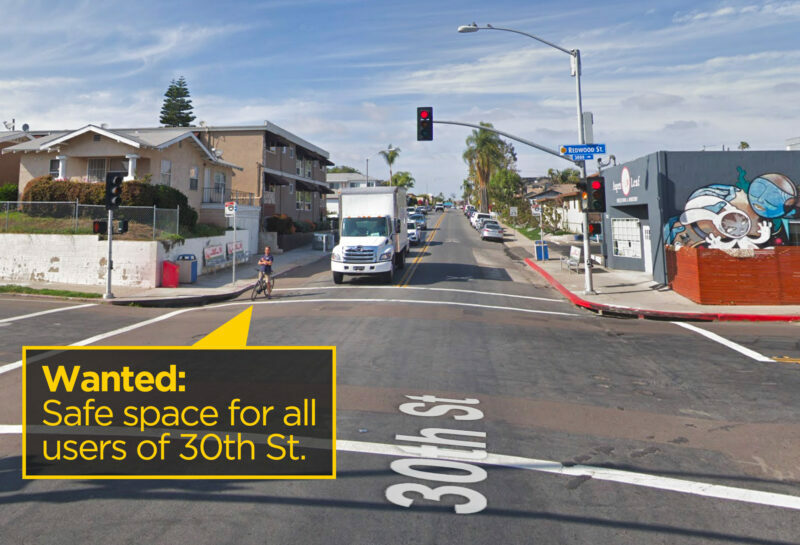 The project encompasses a "road diet" on a 4-lane-wide stretch of West Point Loma Blvd., reconfigured to a 2-car-lane street with a Class 2 bike lane (paint-buffered only) and other traffic calming measures. 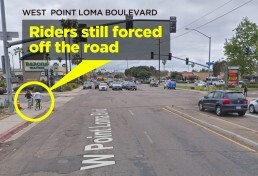 This was the third presentation since October 2018 made by the city to the Peninsula community board about the West Point Loma Blvd. 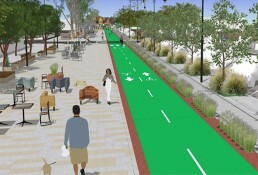 bike lane project. 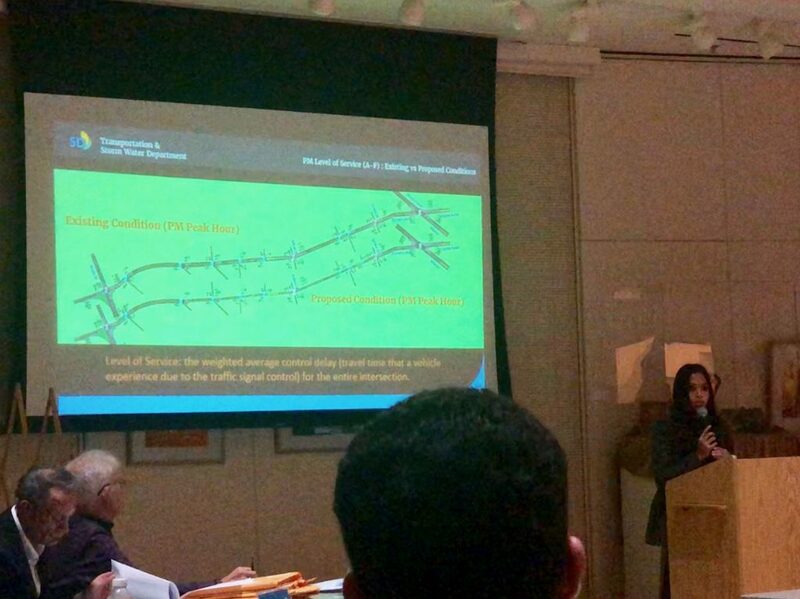 TSW's slideshow gave PCPB the results of their detailed traffic analysis, parking study data, lane configuration drawings, and Level of Service (LoS) impacts — all of which showed minimal impacts on drivers along the corridor — in an effort to win approval from the community board for the project. Unfortunately, the PCPB did not approve the project, though it also did not make a motion of denial. Speakers in support of the project from BikeSD and San Diego County Bicycle Coalition urged the board to approve the bike facility. 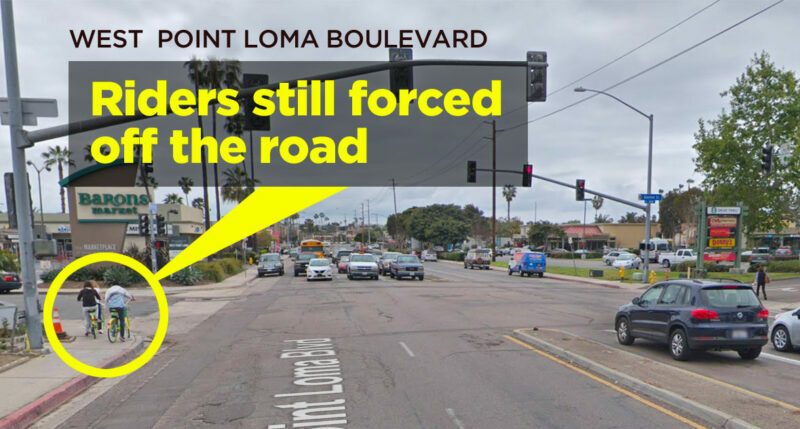 There were also others, including local residents on West Point Loma Blvd, that also spoke in favor of better bicycle facilities along this corridor. There were also a handful of residents that were opposed or had questions. Two audience members took issue with the term "road diet," and insisted that this should be called a "lane removal." Board members' questions focused on issues of traffic delay, the 'back-in/angled parking' configuration, the decline from a Grade B to a Grade C 'Level of Service', and the 'math not working out' when a car lane was removed. These questions were challenging for TSW staff, who gave technical answers that didn't mollify critics on the board. Many of the PCPB board members shared desire for better bicycle facilities but still wanted to critically discuss specific design elements. Nicole Burgess of BikeSD said, "I think some them truly want to be traffic engineers." In the end, there was no vote on the project but the board passed a motion calling for the City to return and discuss it further at the PCPB Transportation Subcommittee. Nicole Burgess wrote San Diego Mayor Kevin Faulconer immediately following the meeting, "I believe the City has done due diligence and provided adequate information as they have presented three times now at the PCPB. Also, as a reminder, the OB Planning Group unanimously supported a road diet to provide safe bicycle facilities." BikeSD believes that Level of Service (LoS) should not be the focus of presentations about bike infrastructure, just as it has been removed as a valid topic for CEQA studies. LoS leads to a very narrow discussion about the impact on drivers and travel-time rather than safety and the equitable use of public rights-of-way. Instead, the Vision Zero Systematic Solutions for Safety should be the leading guideline for these types of improvements. We can not let Community Planning Groups make final decisions for the safety measures needed for our streets to meet Vision Zero and CAP goals. 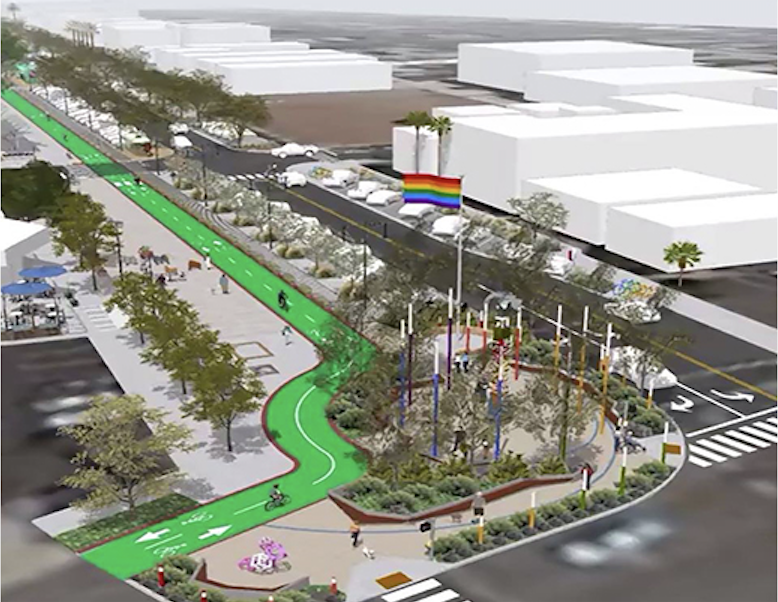 The West Point Loma bike facility was originally proposed by the Bicycle Advisory Board back in the spring of 2018, with unanimous support for the project. 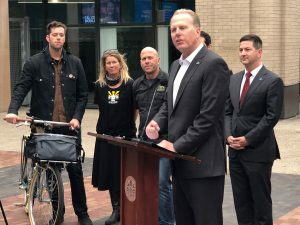 For the safety of all road users, BikeSD is hopeful that Mayor Faulconer and Councilmember Jennifer Campbell will advocate for this type of improvement in their community. We applaud TSW's proposed striping plans and believe this Class 2 bike lane is an essential piece of the puzzle to fill in the gap along this corridor. Estas pistas son de dos vías para ciclistas (carriles especiales para bicicletas que brindan un derecho de paso para ciclistas y ciclistas dentro de la carretera). Los autos estacionados, los postes flexibles y las variaciones de grado separarán las pistas del tráfico vehicular. Cuando las tres fases estén totalmente desarrolladas, el Plan de Movilidad del Centro proporcionará 9,3 millas de estas pistas para bicicletas de dos vías alrededor del centro de San Diego, conectando puntos como el Centro de Convenciones con el Parque Balboa. BikeSD estuvo allí al inicio de las discusiones para el Plan de Movilidad del Centro, estuvimos allí en abril de este año cuando la oficina del alcalde quiso cambiar el diseño y retrasar este proyecto 5 años adicionales, y también estuvimos allí para la conferencia de prensa de hoy. Aplaudimos al alcalde por sacar este proyecto tan a menudo retrasado de la División de Calles de la Ciudad y hacia las calles de la Ciudad. 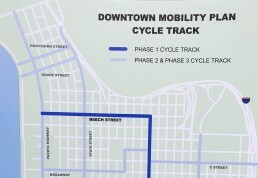 BikeSD and other mobility advocates will need to continue to press the city to move forward on the DMP, especially to push the city to use the Streets Division to implement Phase 2 and 3 of the plan so that it doesn’t get slowed down. 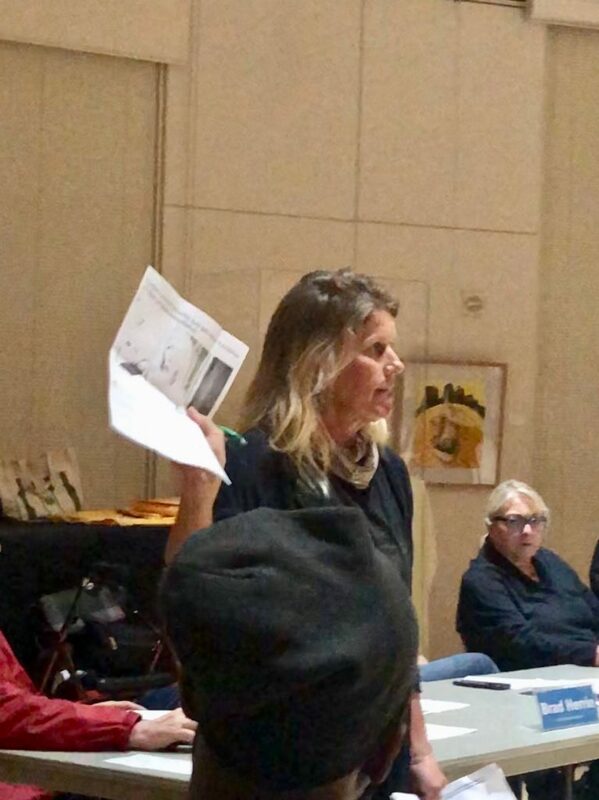 And we expect continued opposition from groups like the Little Italy Association, which has a history of opposing bike lanes in their district. A pesar de que hoy fue un día para celebrar una pequeña victoria para andar en bicicleta, andar en bicicleta y caminar, hay un largo camino por recorrer para completar la visión del Plan de Movilidad del Centro. Los medios de comunicación pasarán de esta historia. Los funcionarios electos pueden cambiar o partir. El personal de ingeniería puede pasar a otros proyectos. Pero BikeSD estará allí, asegurándose de que el Plan de Movilidad del Centro continúe recibiendo atención y avance hacia la finalización completa. The City of San Diego's Balboa Specific Plan irá a la Comisión de Planificación de San Diego tomorrow at 9:00 AM, mañana a las 9:00 AM, jueves 13 de diciembre,en Council Chambers, piso 12, edificio de administración de la ciudad, 202 C Street, San Diego CA 92101. Luego se escuchará en el Ayuntamiento el próximo mes. BikeSD no es compatible con el Plan Específico de Balboa (aquí se encuentra el PDF del plan completo)porque carece de visión para una entrada ecológica a la comunidad de Pacific Beach. BikeSD apoya a los diversos miembros de la comunidad que abogan por un plan mejor que no apunte hacia un futuro centrado en el automóvil para esta estación o esta comunidad. This area of San Diego is receiving a $2.2 billion dollar investment as one of the nation’s thirteen 'EcoDistrict Communities' yet the City fails to support this vision in its design of Balboa Transit Station's with limited access from across Interstate 5 from the west, Pacific Beach. Any transit station is only successful if it addresses the last mile connection between where residents live and the transit services they're ultimately seek to use. Despite a gap between Mid-Coast and Bay that is less than a mile, the Balboa Specific Plan presents no real solution for getting active commuters safely across the I-5 freeway. This will severely lower the use of this new station. The new station design accommodates car and truck access well, with ample parking lots. 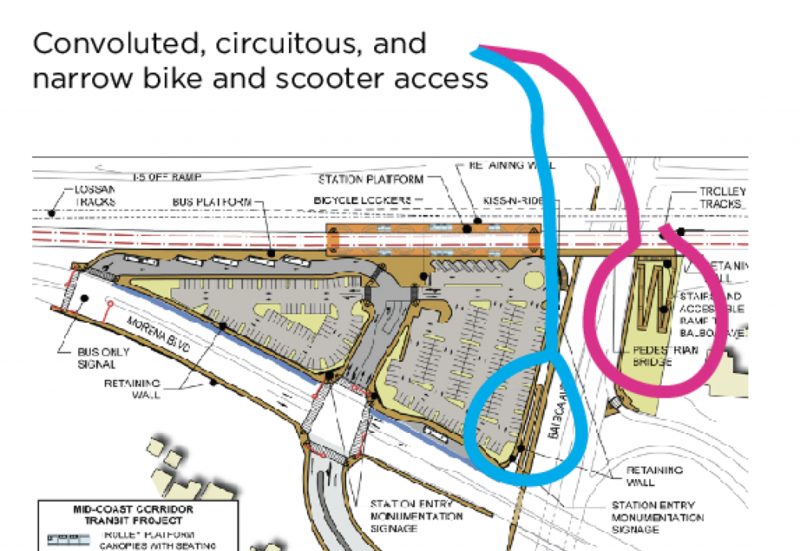 But for transit riders who approach the station on foot, by bike, wheelchair, or micro-mobility devices, all that's provided is a 4-foot wide path across Balboa Avenue. To be successful, this station needs a bigger, first-class multi-use path. Para empeorar las cosas, el pequeño puente provisto en el Plan lleva a los ciclistas y caminantes al lío de una intersección congestionada de vehículos en Garnet Ave. y Mission Bay Drive. Esto es deficiente, terrible planificación. BikeSD says it's time to listen to the residents. They are asking for a multi-use bridge over the I-5 to safely connect all transit users to their homes, to the beach, to Mission Bay, and to the businesses in Pacific Beach. They're asking for a design that lets these residents enjoy their last mile along the waterfront, visiting a local coffee shop, or just getting some fresh air before their next task in life. Necesitamos que el puente (o túnel) propuesto a través de la I-5 esté en el plan y sea priorizado. Se puede hacer y se debe hacer lo antes posible. 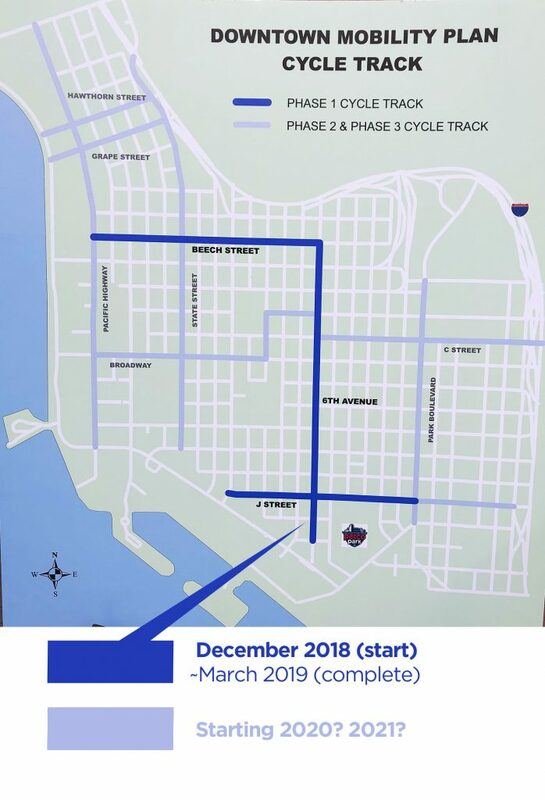 El plan también debe incluir carriles para bicicletas Clase IV en Garnet Ave. y Mission Bay Drive, señalización dedicada para bicicletas e intersecciones protegidas. Esta estación se abrirá y pronto, y es emocionante para nuestra región tener una nueva y hermosa línea de tránsito, pero si no podemos acomodar a estos viajeros ecológicos, hemos fallado en el proceso. And it's also critical that MTS be part of this discussion. Large buses into and out of Pacific Beach is not the answer - innovative small autonomous shuttles will support this movement in a better way and I hope SANDAG and MTS can pilot such a program. 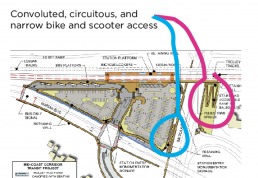 BikeSD recomienda a los defensores del ciclismo, la marcha y el scooting que vayan a la Comisión de Planificación y hablen para agregar un mejor acceso de uso múltiple a la nueva estación, especialmente desde el enfoque del oeste (Pacific Beach).